LG is going to launch the G6 on February 26th at the Mobile World Congress in Barcelona. 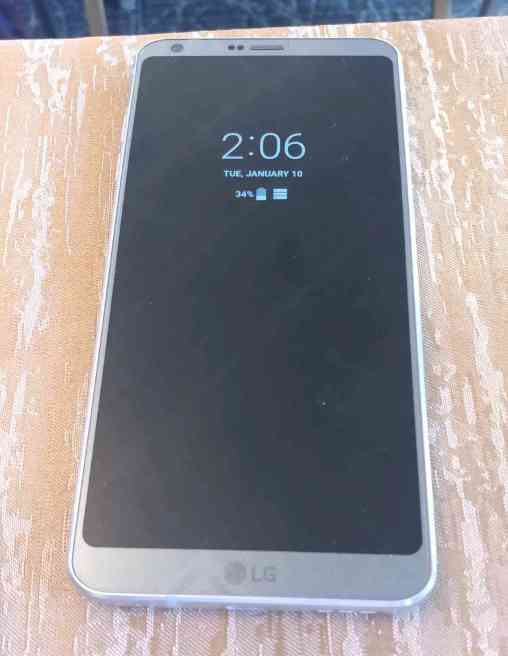 We have gone through a lot of leaks and rumors previously, and today, we have the live image of the LG G6. One thing that is confirmed till now is ‘ no Snapdragon 835, ‘ and instead, the company will use the Snapdragon 821. Just recently, a new rumor also suggested that LG wants to use the Snapdragon 835 for the V30 that will be launched somewhere in September this year. So, after a week, the company will officially unveil the G6, nd it seems the leaks won’t let anything remain in the shadow. Today’s live images show the front as well as the back of the phone, and it pretty much confirms the previous leaks about the design. We can see the glossy metal back which is something very different from previous LG flagships. There is dual-camera setup on the back along with the fingerprint scanner. The placement is the same as in LG V20, and the camera is not protruding out as in the G5. Then there is the ‘G6’ logo on the bottom, and well, that’s everything on the rear, and it seems LG wants a clean look on the back side of G6. Things appear to be changed on the front side as we have the display with curved corners and the bezels are fragile on the sides. The top bezel is thinner than the bottom one, probably due to the LG logo. That’s all about the design, and it seems the live images have cleared every single doubt about the design of the LG G6. Now, the guy who leaked these images also revealed the specs of the device! The LG G6 has a 5.7-inch Quad-HD display and is powered by a Snapdragon 821 processor. There is 4GB of RAM and 32GB internal storage. LG is still launching a 32GB smartphone when even budget smartphone manufacturers are launching variants of their phones starting from 64GB memory. What’s wrong with LG? Anyways, we hope that there will be a dedicated slot for the memory card and not the hybrid one. The G6 is going to be water resistance as the company has already revealed in the teaser and it features the much-improved Quad-DAC. Under the hood, the LG G6 is powered by a 3,200mAh battery which is non-removable. Let’s hope that LG will put a good price tag on the phone. What are your thoughts about the LG G6? Do let us know via the comments section.